Videos show cops confiscating bags of peaches from locals... and spilling them back on the road. Videos show cops confiscating peaches from locals and spilling them back on the road. 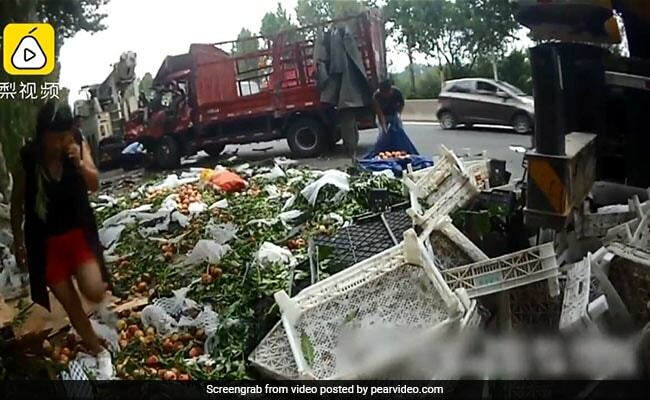 On Friday, a truck carrying over 4,500 kgs of peaches overturned in China, leading to chaos as locals began to loot the spilled cargo. The incident took place in the city of Dezhou, Shandong province. Footage from the site of the crash shows looters filling boxes and bags with the spilled peaches. However, in a bizarre move, the cops called to bring the situation under control did not detain the looters, but instead took their peaches and spilled them back on the road. According to the Shanghaiist, police clarified that looting is a crime punishable with up to 10 days in detention and a fine of 1,000 yuan (approximately Rs 10,000). Officer Sun Shouqiang told South China Morning Post that although most of the looters dispersed when the police arrived, some got angry on being told that what they were doing was wrong. "Officers asked them not to get involved in the accident and to leave, but about 10 women continued to steal the peaches," he said. Footage shared on popular Chinese video streaming website Pear Video shows cops confiscating huge bags of peaches from aggrieved locals and spilling them back on the road. You can watch it here. Videos of the incident have gone massively viral in China, with opinion divided on whether what the locals did was ethical or not. "This is breaking the law," writes one person on the website Miaopai, where the video has collected over 947 million views. "The logistics company will be covered by their insurance. The people are cleaning up the scene for free," says another on Facebook. In April this year, around 1 lakh eggs spilled and cracked on a highway in China after the truck carrying them flipped over.